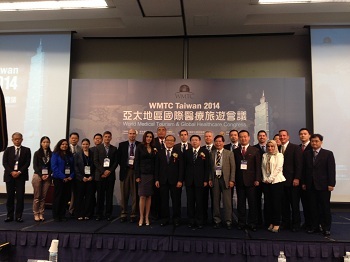 EAJ participated in the World Medical Tourism & Global Healthcare Congress (WMTC Taiwan 2014) held on June 26 – 27, 2014, in Taipei, Taiwan. During the opening conference, EAJ’s executive vice president participated in a panel discussion on medical care for patients abroad, where he introduced EAJ’s services in emergency medical assistance and treatment coordination in Japan for foreign patients, responding to increased interest owing to the 2020 Olympics to be held in Tokyo. Active discussion followed on the subject. EAJ also exhibited at the event, where many members of the medical tourism industry and insurance industry in South East Asia stopped by to discuss medical treatment in Japan and coordinating services to support foreign patients. EAJ is committed to continuing such work in promoting medical exchange and supporting foreign patients’ treatment in Japan.